Our product catalog is our most important communication tool and an essential reference for many architects, construction engineers and applicators in their daily work. 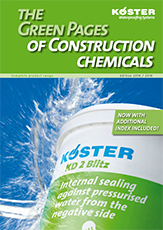 The “Green Pages of Construction Chemicals” contain a comprehensive overview of all fields of applications for KÖSTER products from basement to roof. With its easy to follow format, finding the optimal and complete waterproofing solution for each project is easy.